Misr International University continually works on developing its students’ futures and offering them suitable opportunities to aid them in building their careers. For the fourth year in a row, MIU’s Faculty of Pharmacy has participated in the 21st Dubai International Pharmaceuticals and Technologies Conference and Exhibition (DUPHAT) in Dubai. Two out of the 13 submitted MIU posters won the 7th best Pharmacy Student Innovative Poster Award and the 4th best Pharmacy Student Award. 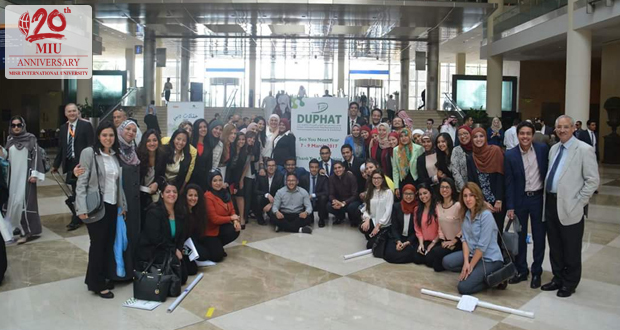 Forty five senior students from the MIU Faculty of Pharmacy attended the conference sessions and presented their research posters.